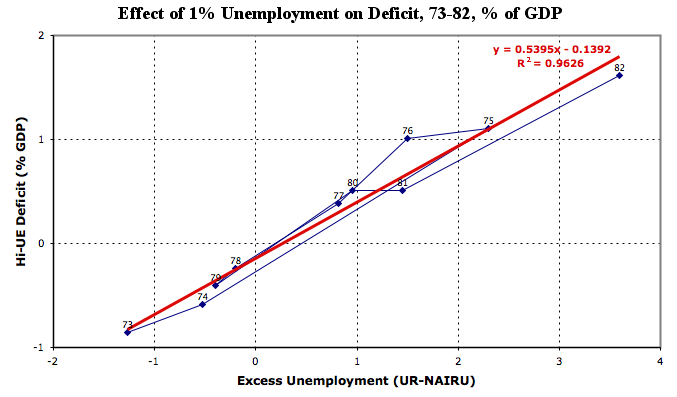 How Much Deficit Does Unemployment Cost? There is a lot of arguing going on about the dangers of increasing the deficit and debt by using federal government spending to end the present high level of unemployment. Whether this is innocent ignorance or a disingenuous, politically-motivated smokescreen, it is an irrelevant argument. An examination of the relevant economic data indicates that if this depression is allowed to continue at the present high level of unemployment, it will cause a serious, ongoing, automatic increase of hundreds of billions in the deficit and debt. 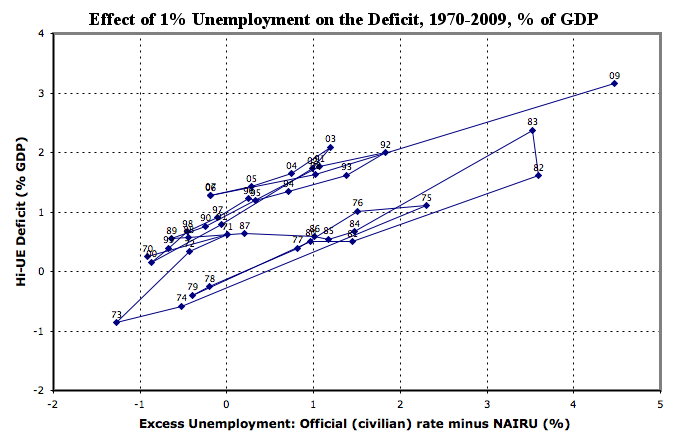 The Hi-Unemployment Deficit  -- the increase in the deficit attributable to excess unemployment. This increase is caused mainly by the "automatic stabilizers" -- the decreases in tax receipts, and increases in unemployment benefits, early retirement, etc., that result from rising unemployment. 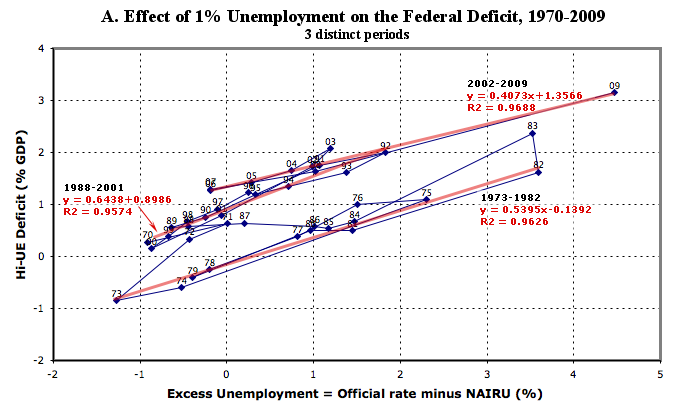 The chart shows three distinct periods in the four decades from 1970-2009 -- 1973-1982, 1988-2001, and 2002-2009 . The regression lines for these periods indicate a high degree of correlation, with R values .96 or .97. 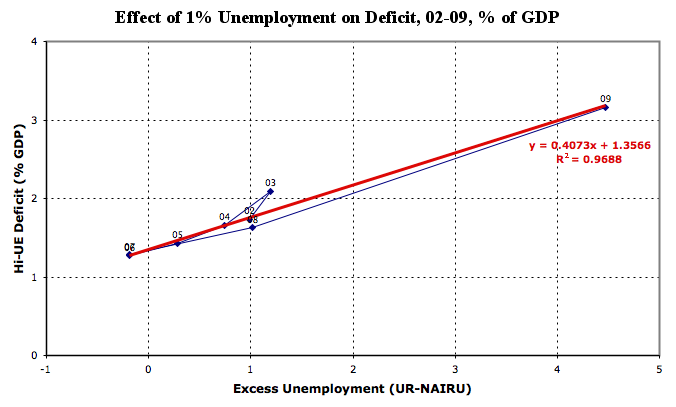 The slopes indicate the deficit/unemployment relationship during that period; for the most recent, the value is .41. 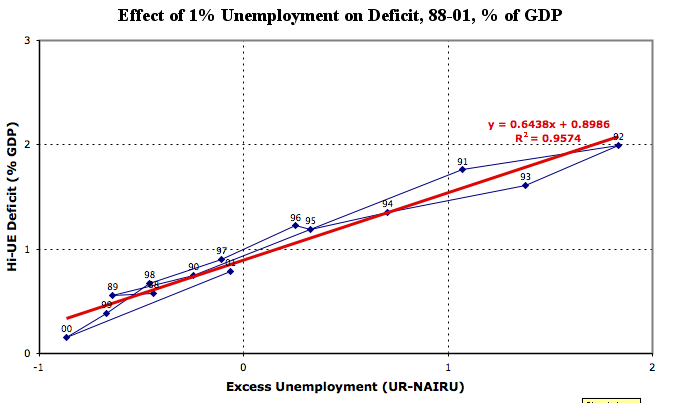 The Hi-Unemployment Deficit is calculated as the difference between the actual deficit and the CBO's "standardized" deficit, which is the deficit as it would be at a "standard" level of unemployment; in the context of a growing economy, we normalize this deficit by handling it as a percentage of GDP. It would be interesting to determine what changes in tax or relief policy caused these distinct and internally consistent periods (also shaded on the above time plot).